Indonesia is the country with the most active volcanoes on earth. There are more than 200 volcanoes with 127 of them are active. The three top active volcanoes located in Sumatra, Flores and Sulawesi. That’s why the average of earthquakes in Indonesia ranges up to five ritcher scale or more. Volcanoes in Indonesia are part of the Pacific Ring of Fire. All of them are grouped into six geographical regions. Four of them belong to the volcanoes of the Sunda Arc. The remaining two groups are volcanoes of Halmahera, including its surrounding volcanic islands, and volcanoes of Sulawesi. Volcanoes in Indonesia are known as fire mountains. They range in height from 3800-meter-high. Therefore, there is organization named the Volcano-logical Survey of Indonesia is the main organization for keeping an eye on volcanoes. Sinabung is a typical stratovolcano near of Brastagi in northern Sumatra. Sinabung is located in a windy area which only 25 miles from Toba lake. It reaches the 2,460 meters of highest point or 8,070 ft. Sinabung volcano has frequently erupted while it flanks produced lava flows. Sinabung has four overlapping summit craters. Its began to erupts since August 2010 until May 2016 which attacked people and some of them were dead. 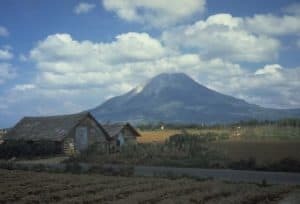 The long eruptions of Sinabung mount is similar to Unzen Mount in Japan, which erupted for five years after lying dormant for 200 years. 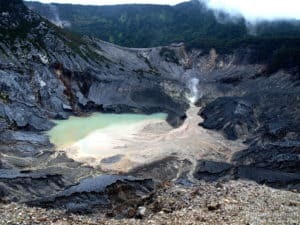 In August 2010, the volcano experienced a small eruption after several days of rumbling while the biggest eruption happened in September 2010 which forced more villagers to leave their houses. The smoke was 5,000 meters in the air while heavy rain mixed with the ash to form muddy coatings. About 17,000 people evacuated in this eruption. 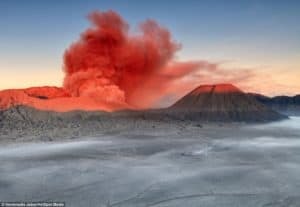 In February 2014, a further eruption occurred and sent clouds of hot ash two kilometers into the air and influenced nearby villages. At least 16 people died as a result of the eruption and one of them is local Journalist. Lastly, In May 2016, Sinabung erupted again for several times and killed at least seven people and critically injured two or more people. All the victims were farmers worked in the village of Gamber, located approximately four km (2.48 miles) from the volcano. Kerinci mount is one of the highest volcano in Indonesia and in Southeast Asia. It has been recognized as the highest peak in Sumatra. Kerinci Mount is located in Kerinci Seblat National Park authority at Jambi Province, Sumatra. Its reach the highest peak with 3805 meters ASL (above sea level) or 12,484 ft. Its volcano active which considered as one of the world heritage site for tropical rain-forest heritage of Sumatra. 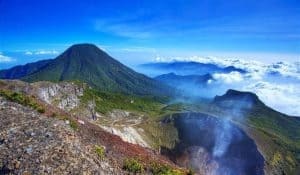 Kerinci Mount began to erupted since 2004 spew clouds of smoke, with plumes reach 1,000 meters (3,281 ft) of height above the summit. In 2009, Kerinci erupted again and followed by 2013, its erupted with 600 m (1,969 ft) spewed black smokes. 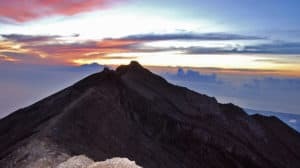 Kerinci mount is one of mount which chosen for most of hikers and backpackers. The track and trail condition of this mountain is easy to follow. The climb up this mountain would take three days to reach the summit. The scenery is magnificent, dominated by beautiful natural creatures. There is also the best place to see the bird flying. It heights boost up their adrenaline to reach the top of the mount. To climb the volcano, better use a guide cause there have been lot of people disappear after attempting to trek alone. Krakatau is an island volcano along the Indonesian arc which becomes the much larger island at Sumatra and Java. Located in the Sunda Strait between the islands of Java and Sumatra in the Indonesian province of Lampung. Krakatau is still active with 813 of highest point or 2,667 ft. Its began to erupt since 1883. The eruption was one of the most deadly volcanic eruptions of modern history. 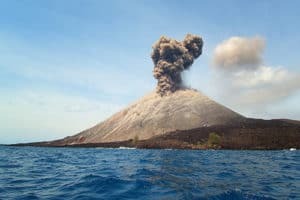 The presently-active vent has formed after the deadly eruption was a small island called Anak Krakatau, which means a child of Krakatau in 1927. The eruption of Krakatau in August 1883 was one of the most deadly volcanic eruptions of modern history. In the afternoon of 26th August 1883, Krakatau suddenly erupted force the boom which be heard in Burma to far away Australia. The erupted killed about 36.000 people and its sound boomed till 4600 kilometers. The volcanic rocks even shouted 80 kilometers far away to Sri Lanka, India, Pakistan, Australia, and New Zealand. Then, Anak Krakatau (Krakatau Kid) mountain appeared with much erupt all the time in low level. Once or twice a year it has slightly larger eruptions that people notice. Merapi mount is one of active volcanic mountain near the center of the island of Java. The volcano is about 20 miles (32 km) north of Yogyakarta. The name “Merapi” from old Javanese language means “the one of making fire”. It reach the 2,930 meters of highest point or 9,610 ft. It is the most active volcano in Indonesia. Smoke can often be seen from the mountain peak. It has erupted regularly since 1548. In 1994, its volcano produced a large pyroclastic flow with a large explosion caused several people dead. last erupted was in 2014. In 1967, It began to built a new lava dome which collapse into the Batang river Valley. Continued in 1994 which caused a major collapse of the growing lava dome and killed 67 people while 6000 people were vacuated. In May 2006, Another large eruption occurred then a magnitude 6.3 tectonic earthquake near Yogyakarta. It caused 5750 people dead, around 40,000 injuries and destroyed large sections of Yogyakarta and sourrounding towns. Its made more than 600,000 people homeless. The earthquake was caused by the collision of the Australian and Sunda tectonic plates. However, for the climber, this mountain is super mystical as it has many mysterious story. Its peak provides the best view of Merapi. It takes almost two hours to go from Yogyakarta to Merapi. Bromo mount is located in located some four hours from Surabaya, the capital of East Java. Bromo mount is a part of the Bromo Tengger Semeru National Park consist of 2,329 meters of highest point or 7,641 ft. This Tengger caldera is a fascinating area which contains fives volcanoes. There are Batok mount (2,470 m ), Kursi mount (2,581 m ), Watangan mount (2,661 m ), and Widodaren mount (2,650 m ) include Bromo mount. Bromo mount is still one of the most active volcanoes in the world. It began to erupt in 2004 till 2016. However, the erupt caused not so much fatalities. Bromo mount is still one of the most active volcanoes in the world. There are areas which prohibited to enter for tourist due to its imminent danger. Bromo mount becomes so popular because its spectacular views and dramatic landscapes. Bromo mount is not among the tallest of Indonesia’s mountains, but the stunning beauty lies in incredible natural setting. The fascinating spot of sunrise all over the world and incredible scene between foreground of Bromo and smoke from Semeru mount in distance are what attracted most of Bromo’s climber. Merbabu mount is a stratovolcano in Central Java province on the Indonesian island of Java. It usually called as “Mountain of Ash”. Located in Magelang district in geographical 7.5° latitude and 110.04° East. It reach 3,145 meters of highest point or 10,318 ft. Merbabu’s first erupted was erupt in 1560. In 1968, Merbabu erupted which caused a lot of erosion. It gives a cozy atmosphere to its green beautiful environment. Lastly, Merbabu erupted with two explosion in moderate size. Meanwhile, Merbabu is one of inactive volcano which most favorite hikes in Java. Semeru mount is the highest volcano in Java. An active volcano with magnificent peak called Mahameru with 3.676 meters of highest point or 12.060 ft. Mount Semeru is in Bromo-Tengger-Semeru National Park. It has been recognized as third highest mountain in Indonesia. Semeru is one of active volcano. What stands out most about this mountain is the fact that it erupts periodically. Since 1818, at least 55 eruptions have been recorded with 10 of them which resulted in fatalities and still going recently. Semeru’s eruptions show the awe-inspiring power of nature. Semeru volcano eruption has happened many times. The first one was recorded in year 1818, which continued to total eight eruptions in the same year. However, the big erupt exploded were started in year 1967. In that year, the mount erupted in six spots. In 2002, the mount erupted several times but did not kill anyone because the cloud did not pass the villages. Meanwhile, In the beginning of 2016, its volcano marked with really bad storm in Semeru. Its trap as many as 600 hikers and causing the hiking trail to be closed on January. However, Semeru is perfectly beautiful for those who loves natural’s creature. It shows awesome scene of Indonesia. Gede mount is located in West Java, Indonesia. Gede mount is part of Gede Pangrango National Park. 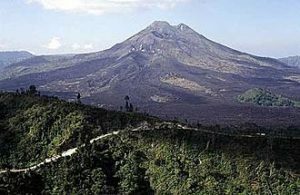 It has two peaks of volcanoes which are Gede and Pangrango mount. 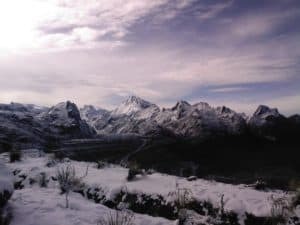 The two peaks are connected by a high saddle known as Kandang Badak (2,400 m). Gede mount reaches 2,968 of highest point or 9,705 ft. The last eruption from Gede was in 1957, and its historical activity consists typically of small and short explosive eruptions. It means that Gede Mount is not listed as one of the decade volcanoes or thought to produce large eruptions. However, the huge populations nearby give a potential for severe destruction if indeed a large eruption did occur. Due a short explosive eruptions term and near from capital city, it sees over 50,000 visitors per year and there is actually a limit to how many climbers are allowed up each day. 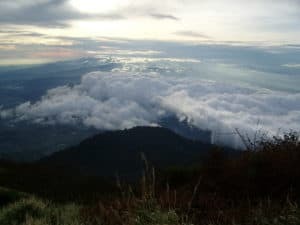 Most hikers destination in Gede-Pangrango National Park is actually mount Gede. Gede mount has not dangerous tracks to reach. It’s pretty safe trails. On track, you will meet the beautiful Cibeureum waterfall. Another impressive attraction is hot streams and spectacular scene to the park. Its best choice if you want to go to camping in the park, and spend all night in tent with beautiful night view of mount Gede. Slamet mount is an active stratovolcano in the Purbalingga regency of Central Java, Indonesia. 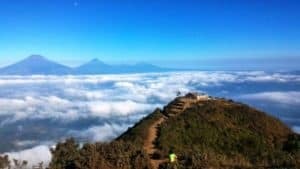 Slamet mount is located in Central of Java, between five districts which are Brebes, Banyumas, Purbalingga, Tegal, and Pemalang. Its recognized as the second highest mountain in Java and the most active volcano in Indonesia. It reaches 3,428 meters or 10,774 ft and contains a wide peaks area with 4 craters. The volcano is composed of two overlapping edifices. Since 1772, It has been 42 erupted until 2014. Fortunately, there were not so much fatalities due to eruption. The eruption began in mid of august in 1772 while in 1847, Its increase volcanic activity. 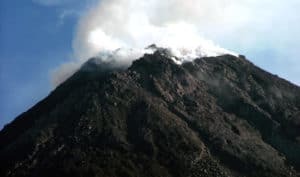 Its continued to increase volcano with the eruption between ash and lava.In 1989, it started to increase seismic activity then in 2009,Slamet mount experienced a small eruption. 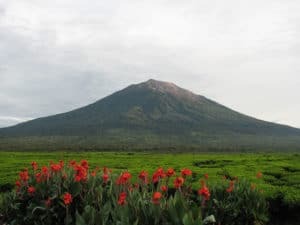 Lastly, in 2004, A volcanic eruption on Indonesia’s Slamet mount is threatening about 24,000 people in seven villages within a six-kilometer radius of the crater on the mountain in central Java. Residents told to carry out their activities as far as is considered safe. Kelud mount is one of an active volcano in East Java. Its located in border line of Kediri city and Blitar city. Kelud city lies between the volcanic massif of Willis mount to the west and the complex of Kawi and Butak Volcanoes to the east. It reaches 1,731 meters or 5,679 ft. Kelud Mount is considered as one of the most dangerous volcano of because its volcano erupt frequently. It has more than 3000 eruptions have occurred since 1000. The eruption has started in 1334 while the big eruption began in 1919 caused some people dead. Kelud mount is including type of strata volcano with a crater lake high. Crater lake surrounded by towering cliffs. The eruptive activity has typically generated deadly mud flows. Its claimed more than 15,000 people dead since 1500. In 1586, eruption produced one of the worst mud flows in the historical record of volcanic eruptions and killed about 10000 people. During 1919, an eruption at Kelud killed on estimated 5,000 people caused hot mud flows. Then in the next few years killed another 250 people until 1966. A strong and explosive eruption on early February 1990 produced high column of fragmental material called tephra. For about seven kilometers and more than 30 people killed. It last erupted in 2014 for about 500 kilometers by sent volcanic ash. Its occurred over a large portion on Java island . Tangkuban Perahu mount is one the most of strato-volcano mount in West Java. Its mountain usually called “Tangkuban boat” because its has a distinctive shape and looks like an overturned boat. It has 2,084 meters of highest point or 6,837 ft. Its include a range of forest area. This volcano consists of numerous active craters is one of leading tourist attractions. Its offered the edge of the crater to view and hot water springs and boiling mud up close. Its erupted since 1826 and last erupted was in 2013. Its eruptions have contributed immensely to the hills north of Bandung through lava flows into the valleys. Tangkuban Perahu erupted in 1910 with a strength of two richter scale. Mild eruption occurred in 1969, spewed ash and barrages 500 m high. Then, In September 1992, unusually high seismic amount lead activity of volcanologists to fear a new eruption. Its lead a mount was closed to the public for a few days. Last erupted was in 2013. Due to the high intensity of the eruption, its create many craters. There are nine craters namely Kawah Ratu, Kawah Upas, Domas, New, Jurig, Demon, and Pangguyungan. Sumbing mount is the third highest mountain Central Java after Semeru and Slamet mountain. Sumbing mount is located in Magelang district. This huge mountain is separated from its similarly conical neighbor, Sindoro Mount, by the Kledung Pass (1,404m) and is the second highest peak in Central Java. At peak altitude of 3,371 meters or 11,060 ft. This strato-volcano dominates the landscape between the city of Yogyakarta and Dieng Plateau. Its peak can be enjoyed through the district as well as from the top of Borobudur temple. Batur mount is one of the mountainous region around Kintamani. 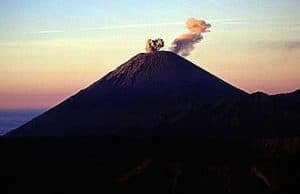 It has been recognized as one of an active volcano in Bali located at the center of two concentric calderas north west of Agung mount. Batur is one of the most impressive calderas in the world which consist of a ‘double caldera’ – one crater inside another. Batur has 1,717 of highest point or 5,633 ft. Batur is a currently active strato-volcano, which has formed in the smallest and youngest calderas. Historical activity at the volcano started in 1849 until 2000. It includes 25 mild to moderate eruption with lava flows. Batur volcano is a popular tourist location on Bali, and offers amazing views of one of the world’s most impressive calderas. Meanwhile, in 1994, Eruptions began with ash of Kintamani fell and continued until 1998 which ash risen up to 300 m above the crater. The big eruption was in 1999 with six explosion occurred. In 2009, volcanic earthquakes increased significantly. There were 53 deeps and 83 shallows volcanic earthquakes. Therefore, Hiking trail was closed at Batur volcano at that time. Agung mount is known as the biggest tracking challenge in Bali. Its located in the eastern side of the island. towards the north-east the volcano slopes towards the Bali Sea. This strato-volcano is the highest point in Bali. It reaches 3,031 meters or 9,944 ft. The Balinese believe that Agung mount is a replica of Meru mount, the central axis of the universe. From the peak of the mountain, We will see the peak of Rinjani mount on the island of Lombok, with some clouds covered both of them. The clouds come from the west and Its take their water so that the west is lush and green while the east dry and barren. Agung mount is one of Indonesia’s largest and most devastating eruption of the twentieth century. Agung mount last erupted in 1963-1964 and still active. Agung mount is one of many volcanoes in Indonesia which has few written records, due to the long period of dormancy. In 1917 and 1926, two eruptions occurred while in 1963 was impulsive exploded. It flows reach distances of up to 15 km from the crater following valleys to the south and east, at speeds of about 60 km/hour. Many villages were destroyed and more than 1000 people dead. More recently erupt was in 1994. More over, Agung mount used to be an active volcano that erupted twice in 35 years. Rinjani mount known has explosive eruptions can happen often and unexpectedly. Since 1846, It has been the site of moderate explosive activity and its lava flows every few decades. Meanwhile in 1994, its erupted and sent ash 500 m high. its exploded can be heard for a week. A cold lava from the summit area of Rinjani Volcano traveled down and some people killed. More than 172 detonating explosions were recorded and 30 people of local villagers reported dead caused a mud flows. In 2004, volcano renewed volcanic activity. Its eruption ejected ash columns 800 meters above the peak. That’s why hikers were banned from climbing Rinjani mount at the time. In 2009, there was an alert for hikers caused an increase of seismic activity. There were three explosion earthquakes and the alert level at the volcano was raised from Normal (Level I) to Waspada (Level II). In 2010, a lovers was dead after trekking in Rinjani. Both were fell on steep section of the caldera wall and died. However, many tourists choose this mount for get an amazing landscape. Kelimutu mount is located near Moni village in the south of central Flores. The volcano is around 50 km to the east of Ende city. It reaches 1,639 meters or 5,377 ft and has been recognized as inactive volcano with last erupted in June to July 1968. This mountain recorded was an active volcano and erupted tremendously big and swiped black lava in 1830. In the year of 1869-1870, Kelimutu erupted with lava. After eruption in 1886, the mount remained three crater lakes with formerly distinct colors; red, blue and white which is become many tourist’s attractions. The color is perfectly blend and create a fascinating lake. 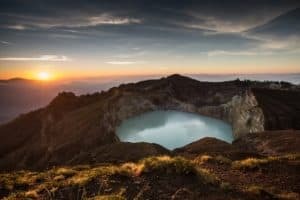 Kelimutu mount has a beautiful crater lake which recognized as the most beautiful lake in Island. Kelimutu mount with its three colors lakes, in a local language called Kelimutu Tiwu Telu, is one of the main volcanoes in Flores island. The colors, however, have changed continually since the eruption of Mount Iya in Ende in 1969. According to experts, the changes caused by the geological and chemical processes in the bottom of the lakes. It could be also the bacteria populations, from refraction of the sunlight, and the chemicals dissolved in the water. However, the changes of its colors make Kelimutu different from others and become one of the attractive places to be seen. Jayawijaya mount is popular because of its peak called Puncak Jaya or Cartenz mount. It recognized as one of the highest peak in Indonesia located in the western central highlands of Papua Province. It reaches 4,884 meters or 16,024 ft. Its peak also the highest point between the Himalayas and the Andes, and the highest island peak in the world. So then, Its recognized as one of seven summits continents in the world. It lies in Lorentz National Park in Papua and has been known as inactive volcano. It known as mountain which no record of eruption until 2016. For the hikers, this mount usually called as Cartenz Pyramid. Therefore, There are many hikers from across the world coming to this mount, trying their luck to reach this mysterious pyramid. Jayawijaya mount is one of mount which has a peak covered with eternal snow in entire Indonesia. The temperature can reach zero degrees up while at night, Jayawijaya will reaches 10-15 degrees. Snow is owned by several peaks which diminishing from year to year and has a long lasting effect. The snow at the top of Jayawijaya is one of the unique natural phenomenon. The natural ice usually does not go down along the equator. If the sun is bright, the snow will reflect sunlight glare but still awesome while its viewed from the air, the peak of Jayawijaya like tapestry covered with white hood. Kembar Mount – One of Pleistocene type of volcano. Located in Northern Sumatra. Besar Mount – Located in Southern Sumatra. A minor sulfur can be found here. Last erupted in 1940. Patah Mount – A heavily forested qua-ternary age volcano. Located in Southeast of Sumatra. Dempo Mount – The highest strato-volcano in Sumatra. It reaches 3,173 ASL ( Above Sea Level ). Kunyit Mount – A fumarolic strato-volcano on Sumatra. It has 2,151 meters of highest point. Tandikat Mount – A strato-volcano in West Sumatra. Last erupted in 1924. Singgalang Mount – A strato-volcano which is twin with Mount Tandikat. No recorded eruption in History. Salak Mount – An eroded volcano with 2,211 meters of highest point in Java. Last erupted in 1938. Tampomas Mount – Composite strato-volcano type located in West Java. It reaches 1684 meters. Guntur Mount – An active volcano. Last erupted in 1847 with 2,249 highest point. Galunggung Mount – Active volcano around West and East Java. It reaches 2,168 meters. Lawu Mount – A massive compound of strato-volcano. Last erupted in 1885. Lamongan Mount – Snall Strato-volcano with 1651 meters or 5,471 ft. Part of Tengger Caldera complex. Ijen Mount – The most active volcano in East Java till now. It reaches 2,799 meters or 9,183 ft.
Karang Mount – Located at the western. Almost end of West Java. It has 1,778 ASL. Pulosari Mount – A volcano with no eruptions history but there are active solfataras. Gagak Mount – Another fumarolic strato-volcano located in Java. Last erupted in 1939. Patuha Mount – One of Composite volcano in Southwest of West Java. There is no record of eruption. Tambora Mount – An active volcano which the largest volcanic eruption in recorded history in 1815. Egon Mount – Located in Southeastern Florest, West Nusa Tenggara. Last erupted in 2008. 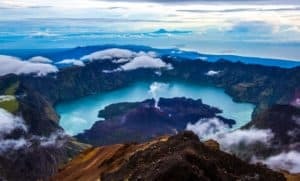 As one of country which located in Pacific of Fire, Indonesia known as country which has so many historical recorded of volcanoes erupted than other countries. Therefore, Indonesia is popular as heaven of an active volcanoes. However, volcanoes in Indonesia shows the best landscape of beautiful panorama which surely catching your eyes.